The Death of Ivan Ilyich [Book Discussion] – my books. my life. Today I’m doing something a little different. I called this a discussion because The Death of Ivan Ilyich by Leo Tolstoy wasn’t really a book I felt I could “review.” Today my books. my life. is the stop on the Imperial Russian Literature Classics Circuit tour (hosted by Rebecca Reid). I adore Russian literature so I jumped at the chance to participate in this tour. However, I’m currently in fear of large novels. Thankfully, I had a copy of The Death of Ivan Ilyich waiting for me on my shelf. This is very different from Anna Karenina and War and Peace in substance as well as length and reads as more of a philosophical writing than a story. So today we dive into a discussion on the topic of death and dying as viewed by The Death of Ivan Ilyich. (I realize many of my regular readers will skip this post but I hope to catch the attention of a few other Russian lit enthusiasts like myself). The Death of Ivan Ilyich begins with the actual death and then backtracks to briefly tell the story of Ivan Ilyich’s life before focusing on the very end of it. Ivan Ilyich led the life he was supposed to lead. He was properly educated and then worked is way up is professional career. He had a wife and kids and worked tirelessly to maintain the appearance that he was successful. It was in maintaining this appearance that he had a slight mishap on a ladder that led to the bulk of the book – his dying. At first, Ivan Ilyich seems unaware that he is actually dying. He goes to doctors and tries various remedies but when nothing works he begins to despair. And though the pain is great, it is the loneliness that overwhelms him. For the first time in his life, he must face something completely alone. As his illness progresses, there is a moment when he realizes he is dying. But it is still impossible for him to accept. Even after admitting that he can’t understand it, Rosencrantz continues to state that he wouldn’t like being in a box. It is impossible for us to completely understand death – we imagine ourselves alive in the box, but being dead makes all the difference. Does this prevent us from ever completely accepting our own demise? When we are healthy, we can shield ourselves from the inevitability of our death. By facing death so closely, Ivan Ilyich can no longer do this. He finds comfort in one person – the pantry boy, Gerasim. Gerasim will hold Ivan Ilyich’s legs up on his shoulders and listen to him speak because it gives Ivan Ilyich some comfort. I found this an interesting idea. Gerasim literally and figuratively holds Ivan Ilyich up. While dying, Ivan Ilyich longs to be treated as a child. And why shouldn’t he long for this despite his “graying beard.” Death brings us as far from our birth as possible yet there are aspects that remarkably similar. The book then moves on to a discussion of living the best life possible. Ivan Ilyich is plagued by doubt and regret that he did not life the correct life because he lived the life he ought. Yet he waivers back and forth with this idea. Though his death is a painful one, it is harder on him mentally than it is physically. He struggles with the idea of death throughout. Finally, after the agonizing time spent dying, Ivan Ilyich faces death up close and is no longer afraid. It is not until the moment of death that Ivan Ilyich is finally able to fully embrace its inevitability and accept it. And I think Tolstoy gets it right here. We will never understand it while we are alive. It is something that must be experienced and that is what makes it so frightening. I mean, even after reading this, I still believe that I am NOT Caius. Don’t you? Has anyone else read this? I am done rambling and I’d love to hear your thoughts in the comments. Oh, and don’t forget to check out the rest of the Imperial Russian Circuit. You can find the list here. I would like to just state that I try very hard not to think of death haha I don’t necessarily believe in heaven as Christianity has described it, I don’t necessarily believe in rebirth or ghosts either. I catch myself, sometimes, thinking about what it would feel like to be dead. And that’s just the thing–you can’t feel it. It’s just nothing. I like to kind of think death is like it is in Peony in Love or the Lovely Bones–not necessarily being an angel, but sort of being able to watch the whole earth, or specific people. Like, a viewing gallery maybe? I know it might seem silly, but I like thinking that I could see what happened after I was gone. And it would be cool if, once we die, we could talk to other people who’ve died–I would LOVE to talk to Audrey Hepburn or Jane Austen. Because we really don’t know what to expect–no one can be 100% sure of what death will be. As for the fact that you love Russian lit and have read a lot of it, I don’t know where to start. I have Anna Karenina, and started it once (didn’t get very far). The only Russian lit I have read is Dead Souls by Gogol. As far as Tolstoy is concerned, what would you recommend I start with? Should I try a shorter one, like Ivan Ilyich, first? Thanks for sharing your thoughts, Kristie. I usually recommend Anna Karenina when people want to start reading Tolstoy but since you’ve tried that maybe a shorter work like this is the best option. Keep in mid that it is very different from his great novels though. I don’t know if it is because I nursed both of my parents and witnessed their deaths, but I just don’t have any difficulty with death. One minute you exist and then you don’t and the body is just a shell. It seems more difficult for those left behind, possibly having a hard life. I have no religious beliefs. As a small child, my beloved granny was the first loss which I experienced. I remember being worried that she might have been half-way through a book when it happened. I still hate the thought of that. I haven’t read an awful lot of Russian Lit. but I did read Liza by Turgenev for The Classics Circuit and it has encouraged me to read a lot more in the future. Thanks for the interesting discussion. I haven’t read any Turgenev yet. Perhaps that will be my next Russian adventure. One cool thing about this Classics Circuit tour is that participants range from those who know a lot (like you) to those who jumped in, in hopes of learning a bit more (like me). I’ve only read “Anna Karenina” (pre-blogging); and the poetry that I read for this tour. 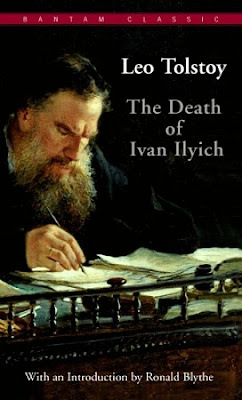 “The Death of Ivan Ilyich” seems like it might be a good one to pick up when feeling very thoughtful and philosophical about the “hereafter”. This is my first experience with the Classics Circuit but I can see the great things about it now. I should participate in a tour that’s out of my comfort zone sometime. Wow great post, this sounds like a deep, if somewhat depressing novel. I haven’t read this one, only Anna Karenina. I agree with Kristie, I try not to think about death too often as well! I have this novella in an anthology that I’ve been reading for the Circuit – I love the depth that sounds like its in there. I won’t get to it by tomorrow, I know, but now I’m looking forward to reading it! Lovely book discussion, Michelle! I have read only some of the shorter works of Tolstoy and ‘The Death of Ivan Ilyich’ is one of my favourite books of his. It is really deep, as you have written in your post. Glad to know that you liked it. I didn’t know about the Imperial Russian Literature on Tour. I feel very sad that it is already over. I would have loved to participate. Hope you enjoy reading Turgenev’s works. He is one of my favourite writers and his ‘First Love’ is one of my most favourite love stories. I loved his ‘Rudin’ and ‘Spring Torrents’ (also called ‘Torrents of Spring’) too. ‘Spring Torrents’ made me cry, because of the way it depicted the folly of youth. The marvel of Tolstoy is his instinctive grasp of the desperate choices humans face in life. He has an uncanny skill in both portraying our ability to love and hate, as well as our motivations and fears. When reading his stories, I often feel myself completely succumbing to his world, as if I’ve known the characters my whole life. The deep emotional and intellectual resonance of his works stay with me long after I close the pages. Such a work is The Death of Ivan Ilych, a short story published in 1886. In it, the reader can see the roots of the moral questions that Tolstoy himself will wrestle with his whole life. The primary question being: what is a good life? For Ivan Ilych, he had answered this question by leading a life that was, “the most simple and most ordinary and therefore most terrible”. A dutiful Russian bureaucrat, his navigated life by relying on the good sense of society to decide what was proper. His chief pleasure came from a sense of his own power over inferiors, and secondary pleasures from playing bridge and indulging in bourgeoisie tastes at home. Yet throughout this innocent ascendance in social position, there were cracks that betrayed a denial of the truth underneath the life of “legality, correctitude, and propriety”. The truth at last manifested itself in the form of physical and psychological pain, plaguing him endlessly and making life more miserable than death. Faced with this curse and sensing death’s close presence, Ivan Ilych began to wonder, “What if my whole life had been wrong?”. The book ends without answering the question of what is the right life, and the only clue the reader is left with is the fresh and sunny image of Gerásim, a peasant in Ilych’s household. Gerásim alone sympathized with his master’s pain. Yet, his simple nature was unperturbed by the thought of death, and presumably his close relationship with nature allowed him to view it as a natural cycle. In Gerásim’s character, one can see Tolstoy’s admiration for the life-affirming powers of the countryside, which is echoed in Anna Karenina and other works. Tolstoy peeled back the layers of ordinary life to remonstrate against its lack of meaning, but because he was just as human as his characters, he could not show the path to a correct life. He leaves us with the image of Ivan Ilych screaming during his last days in anguish, encapsulating a hidden existential malaise that Tolstoy would struggle with his whole life.